Don't Wait— P&D Bot v2.2 released! A complete program to make profits in each pump and dump ! Start by configuring the buy % and sell %. Then insert the coin name. and you'll be ahead of everyone. The overall goal of the bot is to be able to create an environment for a safe general pump without the fear of being dumped on and ultimately losing money. This bot is centered around the user, requires no previous coding experience and includes features to protect users such as a training mode which simulates pump situations in real time, pre-pump detection, as well as a warning in case users start too late into the pump. Our bot is easy to configure ! Configure Buy % , Sell % and insert the coin name ! Expect a new update of P&D bot each week! With new features as well ! A training mode which simulates pump situations in real time. Invest a custom amount of btc. Start P&D Bot on a Windows/Mac. Buy / Sell in some milliseconds . The bot actually supports 4 Exchanges (Bittrex,Binance,Yobit and Cryptopia) . The bots detects prepumps and warns you when you join too late . * Pump with your mobile phone !. We're working on implementing the CCXT module wich is a python library able to connect to all the exchanges. 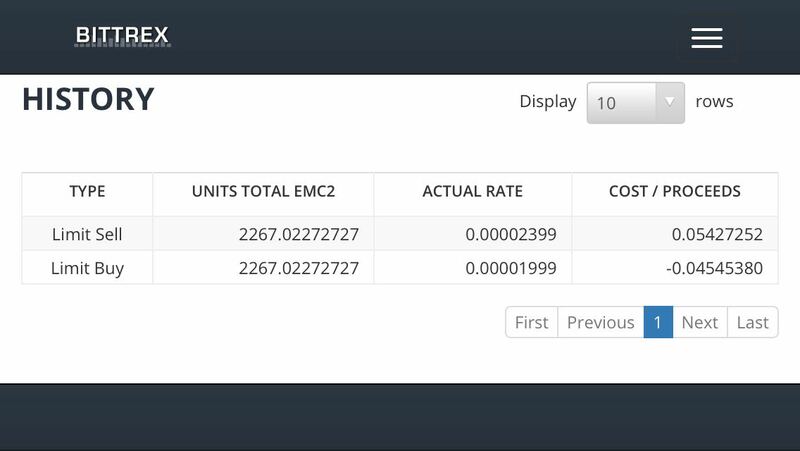 I bought and tested his bot twice and works well so far :D .Here is a screenshot of my transaction. I bought this bot some days ago , P&D bot team was very helpful and they assisted me during pumps and showed me how to use it and maximize my profits ! Thanks. Trader at Bittrex / YoBit.